We’ve taken 4 beers carefully selected from across our Brewshed range – Pub Tropicana, Red IPA, Vanilla Porter and American Blonde – and put them in cans. We feel that these are bold beers, each different to the other and well suited to being in a can. Why cans, we hear you ask? Cans are completely airtight and keep out all light so the beer never gets tainted. Cans are portable, easy to transport and you never have to hunt around for a bottle opener to open them! 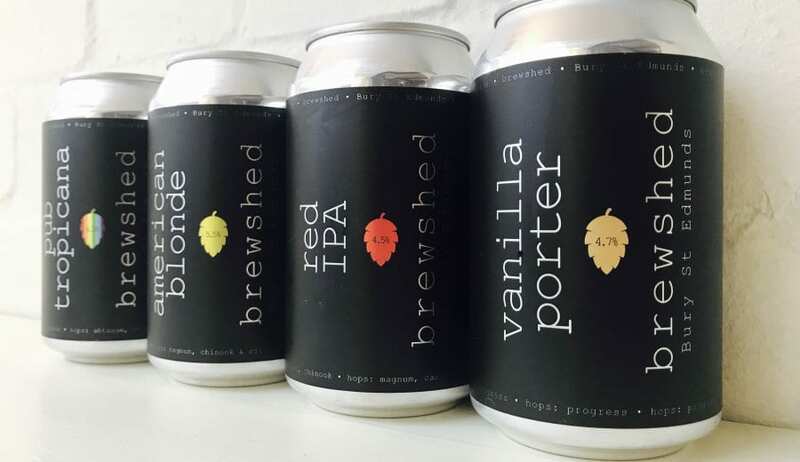 Our cans are available to take out from The Cadogan, The Beerhouse and The Crown (and will be available from The One Bull as soon as we’re able to re-open following the fire next door). They are also stocked at Abbeygate Cinema and Beautiful Beers in Bury St Edmunds, Alder Carr Farm in Creeting St Mary and Suffolk Food Hall in Wherstead. If you’d like to talk to us about stocking our cans, please get in touch on 0 or e-mail info@brewshedbrewery.co.uk.